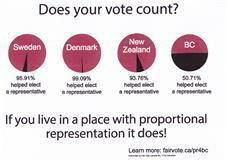 Proportional Representation Vote This Fall! What is it? What does it mean to me? Do BC elections put the right 'representatives' in the legislature? Many want the system changed. And now change is being proposed. 1. Which should British Columbia use for elections to the Legislative Assembly? A proportional representation(PR) voting system. 2. If British Columbia adopts a proportional representation voting system, which of the following voting systems do you prefer? 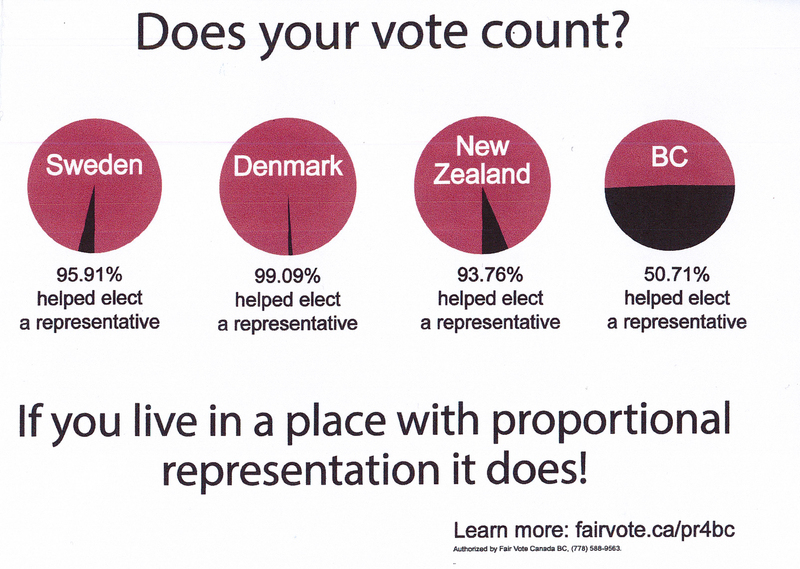 Fair Vote Canada in BC is pro - Proportional Representation. They say that first-past-the-post delivers majority governments to parties with 39% of the vote. With proportional representation, if a party earns 30% of the vote, they get 30% of the seats. Get involved and participate in the conversations and debates. Share your thoughts on this issue. 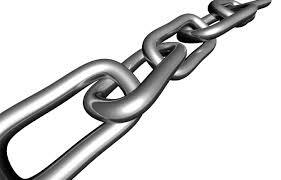 A recent book by Nancy McLean presents an unnerving overview of the 'plot' being pursued by wealthy Americans to permanently install the privileged classes (and undermine traditional democracy) - Democracy in Chains. This blog post from the Institute for New Economic Thinking provides a quick and stirring overview of the research and the story. McLean has stumbled upon the work of an obscure, and shadowy economist named James McGill Buchanan who may have been the architect of the libertarian revolution being pursued in the United States over the last quarter century. Buchanan wrote widely on the interests of those with 'property' and how those interests could and should be preserved.The Koch brothers were keen supporters of Buchanan's work. The book outlines how the efforts on many fronts, from a biased judiciary to a hobbled legislature, have all been part of a comprehensive vision to preserve the wealth and power of a self-righteous elite. It challenges progressive people to think bigger, and to reconsider the political landscape. Those who are committed to the ideal of democracy, and to a socially just world, need stand up. Ordinary people must protect the fundamental institutions and principles of liberal democracy. Buchanan counsels the 1% to re-write constitutions and legislation to the disadvantage of 'everyone else'; to construct a cozy relationship where governments simply serve the interests of the uber wealthy. The extent to which his ideas are being implemented is frightening. So much clamor about taxing those who don't want to pay tax, even though they have won a big prize in our BC Real Estate Lottery. Indeed, the added tax on higher valued homes is fair and the best way to fund schools and social services. Two excellent pieces appear in the Vancouver Sun this past week. One by two UBC academics is concise and on point. Another by Alex Hemingway of the CCPA is also great. The federal government is government is parading the idea of HOUSING AS A HUMAN RIGHT. Their consultation has been extended to close June 8th. You can contribute your thoughts. While the text of their appeal seems heavy on rhetoric and light on action, those of us with a voice should chip in. 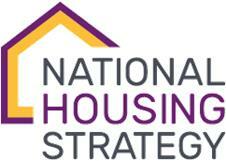 Unfortunately, the much hyped National Housing Strategy promises no more federal funds for community housing. Funding is frozen at the level it has been for almost two decades (@$2B). Meanwhile, CMHC is extracting fees from middle income Canadians and paying a 'dividend' to government of some two or three times that much. They boast, "In 2017, we also declared dividends totalling $4.7 billion to our shareholder, the Government of Canada. An additional dividend of $1 billion was approved by CMHC’s Board of Directors on March 22, 2018."